Rosie Huntington-Whiteley, Ashley Tisdale, and Hilary Swank help honor 100 inspiring women! The 31-year-old English model, the 33-year-old Scary Movie 5 actress, and the 44-year-old What They Had star joined forces at the Create & Cultivate 100 List Launch Event presented by Chevrolet and held at Milk Studios on Thursday (January 24) in Los Angeles. Also in attendance were Whitney Port, Tess Holliday, Catt Sadler, Becca Tilley, and founder of Beautycon Moj Mahdara. Create & Cultivate is the leading online platform and conference for women in business. The Create & Cultivate 100 List highlights 100 women across 10 categories who are making moves and redefining the future of the workplace and the world. It was an evening of celebration for the 2019 recipients who were recognized for breaking boundaries. From powerhouse entrepreneurs to women in fashion, entertainment, STEM, and more, recipients were honored for being driven to #FindNewRoads within their respective industries. Guests enjoyed glam stations, a DJ, a photo booth, treats, light bites, and giveaways. FYI: Rosie is wearing a Marina Moscone top and pants with Jimmy Choo shoes, Ana Khouri earrings, and a Tyler Ellis bag. Hilary is carrying a Tyler Ellis bag. Whitney is wearing C/MEO Collective. Catt is wearing C/MEO Collective. Sarah Hyland & Boyfriend Wells Adams Join 'Bachelor' Stars at iHeartRadio Music Festival! Sarah Hyland rocks the red carpet while attending day one of the 2018 iHeartRadio Music Festival on Friday (September 21) at the T-Mobile Arena in Las Vegas. 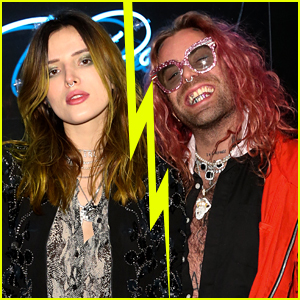 The 27-year-old Modern Family actress was joined at the event by her boyfriend Wells Adams, who you know from The Bachelorette and Bachelor in Paradise. Wells met up with a bunch of his Bachelor Nation buddies at the concert, including engaged couple Ashley Iaconetti and Jared Haibon, as well as Ben Higgins, Nick Viall, Jason Tartick, Blake Horstmann, Becca Tilley, and Dean Unglert. Sarah was one of the presenters who appeared on stage during the festival! FYI: Sarah is wearing a Manning Cartell dress, Sophia Webster heels, Yeprem earrings, and Neil Lane jewelry. JoJo Fletcher Launches Her Fletch Clothing Line with Bachelor Nation Support! 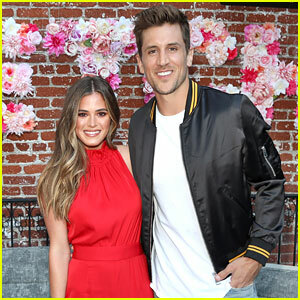 JoJo Fletcher poses for a photo with fiance Jordan Rodgers at the launch of her new clothing line Fletch on Wednesday (June 27) at Beauty & Essex in Los Angeles. The 27-year-old former The Bachelorette star got support from her friends in Bachelor Nation – Becca Tilley, Kristina Schulman, Alexis Waters, and Jasmine Goode. Fletch is all about fitting one’s personality and mood – from feeling bold and empowered to feeling feminine and flirty. The collection offers a range of versatile pieces that enhance your individuality- with a look for every occasion. “I just want to create a line that I feel girls would love and they would wear day-to-day, not just like really fancy dresses, not just casual clothes, but things that you could wear Monday through Friday, Monday through Sunday,” she told Us Weekly. 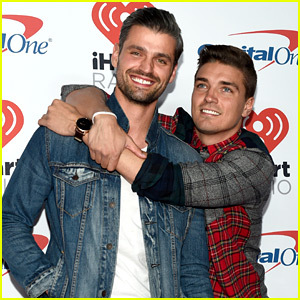 The Bachelorette's Peter Kraus & Dean Unglert Reunite in Vegas! The stars of Bachelor Nation are having fun in Las Vegas this weekend and there was a reunion between Peter Kraus and Dean Unglert, final four contestants on the latest season of The Bachelorette! The guys posed for cute photos while walking the red carpet on night one of the 2017 iHeartRadio Music Festival on Friday night (September 22) at the T-Mobile Arena in Vegas. They were joined by Wells Adams, Becca Tilley, Ashley Iaconetti, and the recently single Ben Higgins. The group got into town the day before and they spent the night at Planet Hollywood Resort & Casino, where they sipped on cocktails at Heart Bar and then had dinner at Gordon Ramsay Burger. On Friday afternoon, the guys were seen having fun at the FlowRider by the Planet Hollywood Pools! The Bachelor's Lauren Bushnell & New Boyfriend Devin Antin Race for Love! Lauren Bushnell and her new boyfriend Devin Antin hold the race flags while attending a race day at Chicagoland Speedway on Sunday (September 17) in Joliet, Ill. The 27-year-old former The Bachelor star, who split from fiance Ben Higgins earlier this year, was also joined by fellow Bachelor Nation favorite Becca Tilley to celebrate McDonald’s new Buttermilk Crispy Tenders. “Nothing says ILY like giving him your last few fries. 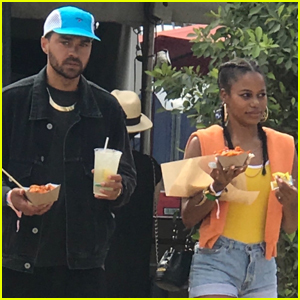 Thank you @mcdonalds for the most amazing day at the track!” Lauren captioned a photo on Instagram in which she is seen feeding her man some fries.